The Tamer Center for Social Enterprise at Columbia Business School announced the winners of its most recent round of funding. Three new social ventures, including the first nonprofit organization and first all-undergraduate founding team, received $25,000 each from the Tamer Fund for Social Ventures. The ventures each take a unique approach to addressing important societal issues, with topics ranging from the lack of emergency medical systems in developing countries to providing quality education in low-income and underserved communities in the United States. In addition to funding, these social innovators gain access to resources provided by the Tamer Center, such as connections to pro bono consulting teams, subsidized co-working space, and support from its advisory network. DeansList Software, cofounded by Matthew Robins, BUS’13, and Akshai Patel, BUS’13, which provides schools with the tools needed to track holistic student data — beyond academics — so that teachers can more effectively address the issues affecting student success. Kinnos Inc., cofounded by Jason Kang, SEAS’16, Katherine Jin, CC’16, and Kevin Tyan, CC’16, which produces a bleach additive called Highlight that improves visibility, coverage, and end-user compliance of disinfectants to better protect healthcare workers and patients from infectious disease. The winning ventures are selected after participating in an application-screening round, a due-diligence process with student teams as part of a Business School course, and a final pitch to the fund’s investment board. To learn more about the Tamer Center, the social ventures and their founders, and previous ventures that have received funding from the Tamer Fund for Social Ventures, please visit: http://www.gsb.columbia.edu/socialenterprise/socialventures/portfolio. More information and the online application are available at: http://www8.gsb.columbia.edu/socialenterprise/socialventures/apply. Established in 2015, the Tamer Fund for Social Ventures provides seed grants of up to $25,000 to early-stage Columbia-affiliated nonprofit, for-profit, and hybrid social ventures. In addition to funding, the ventures gain subsidized co-working space, support from the Center’s Social Venture Advisory Network, connections to pro bono legal services, Columbia student pro bono consulting teams (e.g. 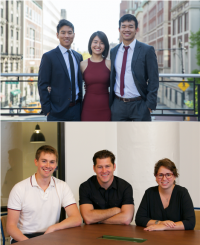 Pangea Advisors, Columbia Impact Investing Initiative (CI3), and the Small Business Consulting Program), as well as the opportunity to hire university students to work full-time through the summer as Social Enterprise Summer Fellows. The Tamer Fund for Social Ventures was made possible by a generous donation by Tony and Sandra Tamer. More information and the online application are available at: www8.gsb.columbia.edu/socialenterprise/socialventures/apply. Application Deadline: March 1, 2017.